My springtime adventures continue and this week grapelive caught up with some of my favorite winemakers and people from my home Carmel Valley to the far reaches of the Russian River. My first stop was just down Carmel Valley Road from where I grew up, about 13 miles from downtown Carmel-by-the-Sea, to see my friends at Parsonage Village Vineyard and to re-taste their amazing 2006 vintage wines in the final blend before bottling next month, plus a couple of new 2007 wines that I had not tried yet. 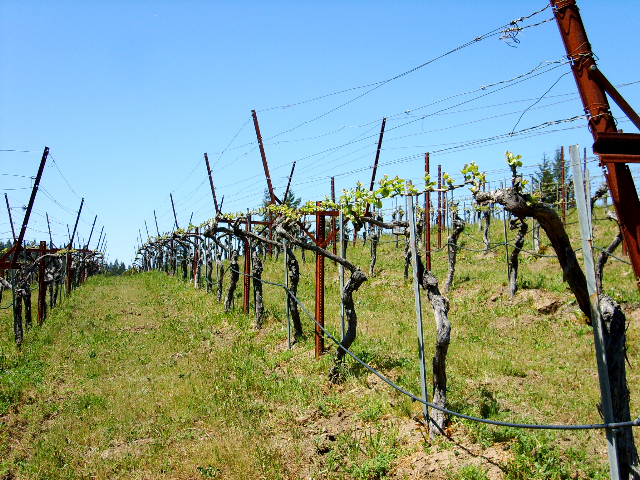 Bill Parson’s small beautiful estate is just getting better and better with each vintage and the wines are becoming even more interesting as they develop here, I think the “Terroir” is now shinning through and the vines are really coming into their own. My first tasting of the 2006 vintage went well, but I did find the wines hard and closed, so I was guarded in my first reviews, though positive to them. Well, now I’m completely amazed and had to really revise my notes and their scores have soared as a result of my recent tasting! Pasonage has added three new wines to their line up, one new reserve cuvee, the Dario Reserve, a Bordeaux blend of Merlot and Cabernet, plus two new Snosrap wines, a Chardonnay and a new Pinot Noir, both of which are from the 2007 Vintage and are looking good for a release in the late fall of this year or maybe winter. Just across the bay, in Santa Cruz, the revolution continues! The new wave of talented winemakers are showcasing the area’s massive potential and delivering wines of amazing depth and style, and I must say, they just plain and simple rock! The Pinot Noir and Chardonnay’s coming from the Santa Cruz Mountains are mind blowing and keep getting better, I think over time they will be on par with the better Santa Lucia Highlands, though in some cases they are there all ready. Then there is Richard Alfaro, he makes wine from both areas, and his latest wines are all winners! His latest release, the 2006 Martin Alfaro Pinot Noir “Garys’ Vineyard” Santa Lucia Highlands just rated to the higher side of outstanding and was my feature wine of the month! Then under his own label, the 2006 Alfaro Family Chardonnay “Lindsay-Page Vineyard” Santa Cruz Mountains (Estate) is a massive effort, a wine that is a block-buster in every way, a big and rich wine that has depth and complexity too. Last year Ridge scored big in Wine Spectator with their Santa Cruz Mountain Estate Chardonnay (95 Points WS) which put the Santa cruz Mountains back into the headlines and Mount Eden has been in the spotlight for decades, but the South Santa Cruz Mountains might even be more interesting, with the likes of Alfaro, Jim Schultze of Windy Oaks Estate, Bradley Brown of Big Basin (doing world class Syrah’s!) and Jennifer Pandol of Pandol Wines leading the charge. Big Basin’s Rattlesnake Rock Syrah has to be the best Syrahs from the whole region and compares with the likes of Alban and Guigal. Jim Schultze’s Windy Oaks Estate brings a Chambolle-Musigny style beauty and class to a California ripe Pinot Noir, in a perfect marriage of old and new world elements, especially their “Wild Yeast” version. Then there is the new comer to this group that is later going to debut her label to the public, Jennifer Pandol, and her Pandol Pinot Noir Santa Cruz Mountains, of which I have mentioned prior notes. Jennifer is a full-time RN, working about 50 Hours a week, and a talented winemaker, and her energy, passion, dedication and caring show in her tiny production wine. She sourced fruit for her first two vintages from the Schultze Vineyard and I was amazed by the never released to the public 2005 Pinot, a wonderful and textured wine, and the Pandol 2006 Pinot Noir, Santa Cruz Mountains which is to be released this summer has the same potential, especially tasting it after its recent bottling. if you want to get on her list email her at: jenpandol@gmail.com, she is only releasing a single barrel of 06, about 20 cases! This kind of passion and quality has the be praised and admired, and I feel the pride and spirit from these special people, and I’ll continue to focus on them and this area for a long time to come! After basking in local glory, I was off to visit formally local winemakers Dylan & Tobe Sheldon of Sheldon Wines, now based in the Russian River, in the hamlet of Sebastopol. I’ve known them for a few years and like the winemakers mentioned above the also put their heart and soul into their wine and it really shows. While Dylan detests the idea of making mainstream wines and he focuses on different flavor profiles and characters, the wines of lovely and clean with surprising brightness and depth. They will focus on their Pinot Noir and their flagship wine “Vinolocity”, a Grenache based Rhone Ranger, there are some hidden gems there too, like the new 2007 Viognier and the 2006 Petite Sirah. Tobe may be the brains and beauty behind this husband and wife team, as she does the website, runs the tasting room and does the books along with her winemaking duties! Dylan is the showman and he is a mesmerizing character that oozes charm and wine knowledge, and many times since I’ve known him, he has regaled me with his insight and intensity. I am happy to report they are doing well and have wine brokers knocking down their door to sell their limited hand crafted wines and I really can recommend visiting their great tasting room inside an old train car in the Gravenstein Station (6761 Sebastopol Ave, Hwy 12, suite 500) next to the very cool Starlight Diner which is also in an old train car, the eggs Benedict were awesome! Then it was a quick blast down River Road to Westside Road, the heart of the Russian River, to visit Gary Farrell, Rochioli Winery and a new winery C. Donatiello (Formally Belvedere) all of which were very nice, though Rochioli was all ready closed as it was after 4 PM on a Sunday, so now you are warned too. The team at Gary Farrell eased through a big crowd and were very attentive to my unannounced needs and poured whatever we wanted, of which the 2005 Gary Farrell Pinot Noir Allen Vineyard, and the 2005 Gary Farrell Chardonnay Westside Farms stood out, this is a place to visit when you have more time and a non-drinking driver! Their tasting room has one the best views and is a comfortable place with friendly people, and again they all are engaging and easy going. After just missing my favorite, Rochioli, my disappointment was short lived by stopping at the brand new, less than a month old winery, C. Donatiello and tried their very good, if pricey, Chardonnay and Pinot Noir of which two of the three would be considered 90-92 Point wines. My favorite was the 2006 C. Donatiello Pinot Noir Floodgate Vineyard, Old Vine, Russian River Valley, though compared with other wines at almost half the $57 tasting room price, it didn’t seem to be a bargain, but in the end I got one anyway as it was distinct and complex. The winery and tasting room are very nice and the staff was focused on letting the customer really immerse themselves in the wine, which is most enjoyable, plus they pour in big glasses in full flights of three to compare, this is how it should be done. *I’m working on all the reviews and should have many more new posted soon, thanks. This is a great time of year to be in the wine country, it is before the summer tourist rush and all those new releases to try are more available. Plus some of the winemakers are not too busy, allowing them some time to travel, even to me! This week I got to catch up with Chad Melville of the famed Santa Rita Hills Melville Vineyard and estate winery. Chad is a great guy and super person and it was wonderful to taste through the line up of Melville wines, that he makes with the ultra talented Greg Brewer, (Brewer-Clifton) plus he brought in his own label he makes with his wife Samsara. 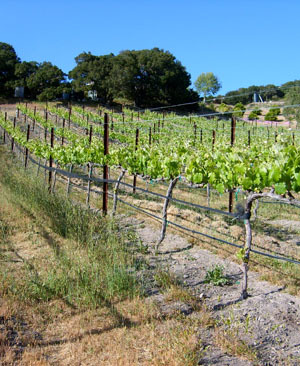 Melville is a small winery that produces some of the best value wines in California, including Chardonnay, Pinot Noir, Viognier and Syrah, all of which are very good to outstanding. It was a lot of fun to get the inside scoop to the vineyards used and learn Chad’s winemaking priorities, and I found out that he wants to make the most natural wine he can and express the terroir the best that he can, well so far so good, as you’ll see below I really loved all the wines I tried. His Samsara wines were stunning as well and they showcase his own talents as a star winemaker. 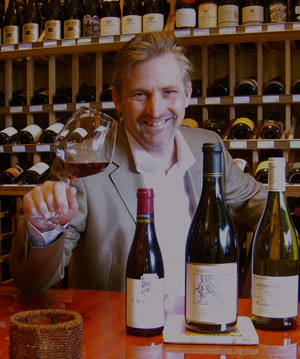 Chad loves the cool climate wines and enjoys working with Pinot Noir and Syrah from his family vineyards as well as a couple of other premium sites that are well suited to his ideas. 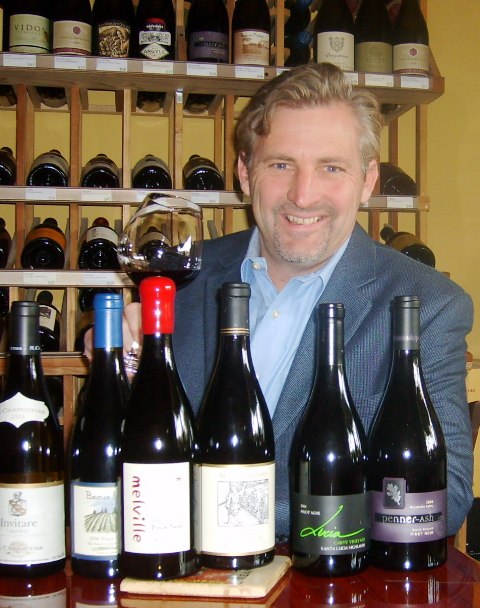 His Syrah has wonderful perfume and lovely zesty spices, making it his own little version of Cote-Rotie, truely it is an amazing wine, and the Pinots are just as good, so check out Samsara wines if you can and be sure to pick up some Melville too. *A correction mention. 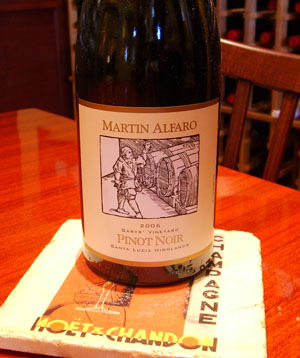 I put the 2006 Martin Alfaro Pinot Noir Garys’ Vineyard as my Wine of the Month for May, and I gave all the credit to Richard Alfaro, and that was a big mistake. Joe Martin, Richard’s partner was the winemaker and I would like to put that right. Joe, I’m sorry for my slight, you have made an awesome wine and deserve the kudos! Please check out all the great wines made by Joe Martin and Richard Alfaro at their website MARTIN ALFARO WINERY, besides their amazing Garys’ Pinot they have just released one of my other favorites, the 2006 Martin Alfaro Pinot Noir “Schultze Family Vineyards” Santa Cruz Mountains, which is one of the best deals in Pinot Noir out there!